Could the sphinx of Mars be proof of an alien civilization as great as our own? What was heralded as “arguably the biggest discovery in the history of science” last week – a fossilized organism embedded in a meteorite which arrived on Earth from Mars – is the first evidence of life beyond our own world. Could advanced life forms have existed on the Red Planet millions of years ago? Robert Bauval and best-selling author Graham Hancock, whose book, Fingerprints of the Gods, was the publishing phenomenon of last year, believe there is evidence to support this. Monumental structures on the planet’s surface have mystified scientists for 20 years. Are they the result of natural processes…or the remains of a great civilization? Decide for yourself. The sensational announcement that a fist-sized meteorite from Mars contains signs of life has so far been accepted by scientists as evidence that only ‘incredibly primitive’ organisms may once have existed on the planet. Yet it could mean far more. The meteorite, billions of years old, is thought to have landed in Antarctica about 13,000 years ago, after being “splashed off” the surface of Mars by a cosmic collision – probably with a comet – at least 15 million years ago. We know from our experience on Earth that life is always evolving to higher species. During the thousands of millions of years after that rock and its fossils formed on Mars there was ample time for incredibly primitive organisms to have become much more complex – perhaps even forms capable of developing a civilization. After all, the Earth and Mars are not thought to be much older than 4.5 billion years and the first incontrovertible evidence of life here – bacteria and algae – does not appear in the fossil record until 3.1 billion years ago. From those primitive organisms, we evolved. So why should precisely the same sort of processes not have taken place on Mars? What raises the stakes in such speculation is the existence of remarkable evidence that complex artificial structures – monuments, gigantic edifices – may have been built on Mars at some remote date. These structures, detected in NASA video images sent back by the Viking Orbiter in 1976, have never been photographed since but have become the focus of a widening controversy over the past 20 years. Because they include several enormous pyramids and a massive Sphinx-like face, an apparently lunatic fringe argues that they must be the work of intelligent and technologically advanced beings. A civilization, in other words. Scientists have officially opposed this view, asserting that the structures are not structures at all but tandem geological patterns. Sagan urged that forthcoming American and Russian missions to Mars should make a special effort “to look much more closely at the pyramids and at what some people call the Face and the City. The Face on Mars was identified on Viking frame 35A72 by Dr. Tobias Owen, who is now professor of astronomy at the University of Hawaii. The same frame, covering approximately 34 by 31 miles – also shows many other features that could be artificial. These cluster around latitude 40 degrees north in the region of Mars known to astronomers as Cydonia, and were photographed from an altitude of more than 1,000 miles with relatively poor resolution. A casual glance reveals only a jumble of hills, craters and escarpments. Gradually, however, as though a veil is being lifted, the blurred scene begins to feel organized and structured – too intelligent to be the result of random natural processes. Although the scale is grander, it looks the way some archaeological sites on Earth might look if photographed from 1,000 miles up. The more closely you examine it, the more it is apparent that it really could be an ensemble of enormous ruined monuments on the surface of Mars. For a long while after the 1976 Viking photographs, NASA and other scientific authorities continued to disseminate what one researcher calls “the bogus claim that the Face is a trick of light and shadow”. This notion began to be challenged seriously only when Vincent Di Pietro, a computer scientist and former NASA consultant, discovered another image of the Face on frame 70A13. This second image, which had been acquired 35 Martian days later than the first one and under different lighting conditions, made possible comparative views and detailed measurements of the Face. Complete with its distinctive Sphinx-like headdress, it is now known to be almost 1.6 miles long from crown to chin, 1.2 miles wide and just under 2,000 ft.. high. Image analysts say the bilateral symmetry of the Face, which has a natural, almost human appearance, is most unlikely to have come about by chance. This impression is confirmed by other characteristics that have subsequently been identified under computer enhancement. These include ‘teeth’ in the mouth, bilaterally crossed lines above the eyes, and regular lateral stripes on the headpiece – suggestive, to some researchers at least, of the headdress of ancient Egyptian pharaohs. The same is also true for the ‘D&M Pyramid’ (named after Di Pietro and his associate Gregory Molenaar, also a former NASA contractor, who discovered it). This five-sided structure stands about ten miles from the Face and, like the Great Pyramid of Egypt, is aligned virtually north-south towards the spin axis of the planet. Its shortest side is a mile, its long axis extends to almost two miles and it is half a mile high. Hoagland has made his own detailed study of Frame 35A72 and has identified additional, possibly artificial, features. These include the so called Fort, with its two distinctive straight edges, and the City, which he describes as ‘a remarkably rectilinear arrangement of massive structures interspersed with several smaller pyramids’. Hoagland also points out another striking fact about the City: it seems to have been sited in such a way that the inhabitants would have enjoyed a perfect, almost ceremonial, view of the Face. The impression of a great ritual center, shrouded under the dust of ages, is enhanced by other features of Cydonia, such as the Tholus, a massive mound similar to Britain’s Silbury Hill, and the City Square, a grouping of four mounds centered on a fifth, smaller mound. This configuration, so suggestive of cross hairs, turns out to be located at the exact lateral center of the City. In addition, a group of British researchers based in Glasgow has recently identified what looks like a massive four-sided pyramid, the so called NK Pyramid, 25 miles west of the Face and on the same latitude (40.8 degrees north) as the D&M Pyramid. In the same general area is a feature called the Bowl, approached by a tapered ram that has been likened to the stairway of a Mexican pyramid. O’Kane’s hunch is strengthened by the fact that ‘many of the structures are non-fractal’. In plain English this means that their contours have been scanned and assessed as artificial by highly sophisticated computers. ‘What we have, therefore,’ sums up O’Kane, ‘is an improbable assortment of anomalies. 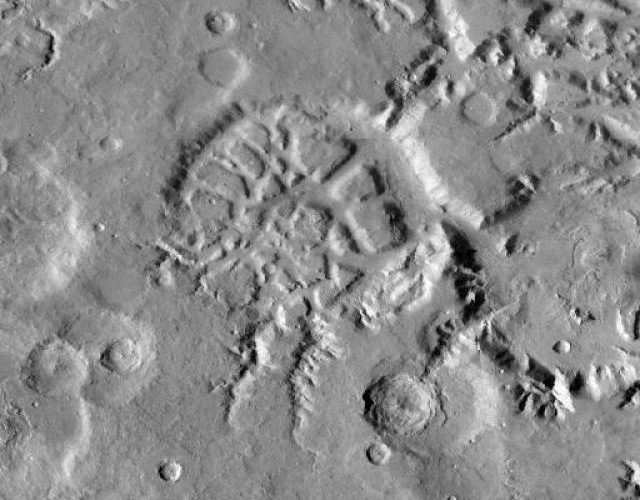 They have alignments, they’re grouped, and they’re non-fractal.’ Nor is Cydonia the only site on Mars to have yielded photographic evidence of unusual and apparently artificial structures. Pyramids have been identified elsewhere, notably in the region known as Elysium, on the opposite side of the planet where , as early as 1971, NASA’s Mariner 9 spacecraft photographed a group of mile-high three-sided structures. Other Martian features that are decidedly non-fractal include a straight line more than three miles long defined by a row of small pyramids, extensive rhomboidal enclosures in the south polar region, and a weird, castle-like edifice rising to a steeple more than 2,000 ft. high. If there was a civilization on Mars capable of creating such monuments, then what might have happened to it? Since extensive damage typical of explosive penetration is apparent on some of the structures, notably the D&M Pyramid, more than one researcher has suggested that the Martians might have destroyed themselves in a suicidal war. A geological cataclysm is another possibility. Analysis of the Martian meteorite suggests the Red Planet was warm and wet – an environment that is likely to have been hospitable to life. Today, it is permanently frozen. The change may have been caused by a very large and rapid slippage of Mars’s outer crust, a phenomenon which has also been cited as a possible cause of the cataclysmic end of Earth’s last Ice Age 13,000 years ago. Evidence reported in Scientific American magazine in 1985 confirms that Mars did at some unknown stage in its history, suffer a catastrophic crustal displacement. If this had happened during the planet’s warm and wet phase, any civilization present at that time would almost certainly have been wiped out in the ensuing global floods and earthquakes, leaving behind only whatever scattered ruins and monuments were massive and stable enough to survive. The pyramids and the sphinx on Mars seem to fit the bill. And if they are artificial, then the implications for our idea of ourselves and our place in the universe are shattering. One top priority in President Bill Clinton’s recently announced program of intensified Mars exploration should be a mission to find out for sure, particularly so since NASA has hitherto refused to include Cydonia in the list of more than 150 sites of scientific interest that it recognizes officially on Mars. Similarly, investigators would be unwise to ignore the fact that there is a region very like Cydonia on Earth – Egypt’s famous Giza plateau – which has its own distinctive pyramids and Sphinx. Associated with these ancient monuments is a tradition that they were built by an antediluvian race as repositories for scrolls and books of past ages, and intended ‘to prevent the ancient wisdom from being lost in the Flood’. Could that flood have been the cataclysmic 400 ft. rise in sea levels that we know took place 13,000 years ago at the end of the last Ice Age? And could there be some sort of bizarre interplanetary connection, not yet understood, between the story of civilization on Earth and on Mars? WERE MEN BROUGHT TO EARTH BY A METEORITE? Is there an extraordinary connection between the Martian meteorite containing what scientists believe to be a fossilized organism and mysterious structures on the surface of the Red Planet? Robert Bauval and Graham Hancock, authors of the number one bestseller Keeper Of Genesis ( Message of the Sphinx ), which was serialized in the Mail earlier this year, believe there could be. On Saturday, in the first part of their controversial series, they described the strange monumental objects in Cydonia, a region of Mars, and how they could be the remains of a long-dead civilization. They also pointed at the bizarre similarity between a structure called The Face and the Egyptian Sphinx. Today, in the second part, Bauval and Hancock focus on the other inexplicable links between Mars and ancient Egypt . At some points in its orbit Mars passes less than 30 million miles from Earth – in cosmic terms just outside our front porch compared to the nearest star, Alpha Centauri, which is 26 thousand billion miles away. Therefore it is not beyond the bounds of possibility that there could be a connection between life and civilization on Mars and life and civilization on Earth. Since time began, Earth has played host to literally millions of strange visitors from outer space – meteorites. IT has been estimated that a million meteorites hurtle through the Earth’s atmosphere every year. Fortunately most of them are tiny and quickly burn out after entry, appearing to us as ‘shooting stars’. A few survive the atmosphere and reach the ground. These can be as small as a ping – pong ball or as large as a London bus. The most spectacular meteorites found on the Earth are the large ‘oriented’ meteorites, so called because they cut through the air retaining their direction of flight like a cannon shell, with their front part taking the brunt of the frictional heat. When they hit the ground they are found to be shaped like cones or pyramids. Wonderful examples of ‘oriented’ meteorites can be seen in museums around the world. a 15-ton ‘oriented’ iron meteorite called Willamette is displayed in the Smithsonian Institute in New York and another, called Morito, can be seen at the Institute of Metallurgy in Mexico city. Such an ‘oriented’ meteorite, probably pyramidal in shape, could have been at the root of the mystery of the Giza pyramids. It is known that long before the so-called pyramid age of Egypt (circa 2,500 BC) a strange pyramidal or conical ‘stone’ was kept within a sanctuary called the Temple of the Phoenix, 12 miles to the east of Giza in the sacred city of Heliopolis. This mysterious stone was called the Benben, derived from the root Ben – a word which Egyptologists say means ‘seed” or procreation’. Other details that ancient Egyptian texts give us about the Benben strengthen the possibility that it may have been a meteorite. We are told that it came ‘down from heaven’ like the fire-bird or Phoenix. It was also said to have been ‘sent by the gods’ at the moment of ‘ Creation’ -0 an epoch the pharaohs called Zep Tepi, literally meaning ‘The First Time’. In our book , Keeper Of Genesis, we used the science of astronomical alignments to calculate the date of the ‘First Time’ to 12,500 BC. The implication, if the Benben was indeed an oriented meteorite, is that it landed in Egypt in precisely the same period during which the meteorite containing a fossilized organism from Mars arrived in Antarctica. The original Benben of Heliopolis – an object that was already old in the time of the ancient Egyptians – is lost. Whatever its origins , it must have been of paramount importance to the pyramid builders, because stylized replicas of it served as the capstones of all pyramids. A surviving example, carved in one piece out of a hard stone known as diorite, is in the main hall of the Cairo Museum. On it are two rows of enigmatic hieroglyphs evoking the ‘Lord of the Horizon’ (the rising sun, according to Egyptologists) and making reference to a deity called Sahu, identified with the constellation of Orion and the deity Osiris – the archetypal god of the ‘First Time’, whose ‘Divine seed’ created humanity. Beneath the complex layers of symbolism, the ancient Egyptian texts can be taken to link the origins of life – and civilization – to the arrival of a meteorite. Within the past ten years, scientists have independently reached a similar conclusion, arguing that life on Earth may indeed have been imported – or ‘seeded’ – by a meteorite or a comet, billions of years ago. A striking characteristic of the pyramids and Sphinx of Giza is the way in which they are integrated into a grand architectural plan, based on mathematical and astronomical data. There is no evidence that the pyramids were used as tombs. What is certain is that two narrow shafts emanating from inside the Great Pyramid were directed to two specific stars: Zeta Orionis, one of the three stars in Orion’s belt, and Sirius, in the constellation of Canis Major. It is certain, too, that the principal Giza monuments form an accurate terrestrial ‘map’ of the three stars of Orion’s belt as these constellations appeared in 10,500 BC. Who could have been observing the skies over Giza in 10,500 BC and who, at that date, could have had the technical capacity to realize such monumental works as the Sphinx and the pyramids? Egyptologists assert there was no civilization on Earth at that time, let alone one capable of planning and building such immense, well engineered structures. If they are right, why do the alignments of Giza so plainly and repetitively mirror the skies of the 11th millennium BC? Former NASA consultant Richard Hoagland is convinced there may be a ‘terrestrial connection’ between Giza and Cydonia – the region of Mars where the mysterious structures are located – perhaps a common source that imparted the same legacy of knowledge and symbolism on both worlds. Hoagland’s interest in Giza began when he met Dr. Lambert Dolphin, a scientist from the Stanford Research Institute (SRI) who had conducted radar and seismographic research to locate hidden chambers near and under the Great Sphinx. Dr. Dolphin was captivated by Hoagland’s idea of a ‘Martian Sphinx’ – the Face – and , in 1983, was instrumental in helping Hoagland set up the Independent Mars Investigation Project under the aegis of SRI. The discription also fits the lion-bodied, human headed Egyptian Sphinx. Another coincidence is that the ancient Egyptians called the Sphinx Hor-em-Akhet, meaning ‘Horus in the Horizon’. Horus – the hawk-god, the divine child of Isis and Osiris – is a name derived from the Egyptian word Heru, which translates a s ‘face’. Helped by a mathematician, Erol Torun, Hoagland has also identified a number of intriguing mathematical and geographical connections between Cydonia and Giza. Torun was among the first to realize that one of the large; ‘pyramids’ on Mars, the D&M Pyramid, contains a variety of functions and constants used in a sophisticated mathematical system known as tetrahedral geometry. Evidence of such high mathematics in supposedly natural structures is strongly suggestive of a conscious design. A trigonometrical function, the arc tangent of ‘e’/pi, gives the value of 40.8 which is the Mars latitude on which both the D&M Pyramid and the NK Pyramid are sited. Amazingly, another trigonometrical function, the cosine of ‘e’/pi, gives the value 30 – the exact geographical latitude of the pyramids of Giza on Earth. Hoagland has demonstrated that the Great Pyramid of Giza contains ‘tetrahedral’ functions identical to those of the D&M Pyramid on Mars, and Torun has shown that the positioning of the Great Sphinx, relative to the pyramids, expresses the ‘Cydonian ratio ‘e’/pi. ‘The odds of such correlations happening by coincidence on two neighbouring planets are somewhere in the region of one in 7,000, says Hoagland. What makes coincidence look even less likely is a bizarre link to another ancient site on Earth. One of the key angles of Cydonia, repeated again and again, is 19.5 degrees. this is precisely the latitude (19.5) degrees north) of the mysterious Mexican city of Teotihuacan, ‘the place where men became gods’, with its three distinctive pyramids dedicated respectively to the Sun, the Moon, and to Quetzalcoatl, the Central American counterpart of Osiris. Last week, in a statement on the implications of the Martian meteorite and its fossils, President Clinton promised to launch a whole fleet of space probes to the Red Planet. The first of these, designated Pathfinder 1, is scheduled to leave Earth in November. Is it a coincidence that the name of the ancient Egyptian jackal-god Upuaut means ‘Opener of the Pathways’ – literally ‘Pathfinder’ – and that Upuaut was also the name given to the small robot camera that was used to explore the narrow ‘star-shells’ of the Great Pyramid earlier this decade? Designed and operated by the German engineer Rudolf Gantenbrink, Upuaut stunned the world in March 1993 when it revealed a ‘door’ blocking the entrance to a hidden chamber at the end of the shaft pointing to Sirius (a star the ancient Egyptians identified with Isis, mother of the divine child Horus). Why shouldn’t the pyramid builders have concealed behind that door the fabled lost relic of Heliopolis – the Benben. We may soon know the answer. Egypt’s Supreme Council of Antiquities has announced that an attempt will be made later this year to open the ‘door’ at the end of the Sirius shaft. The secret chambers beneath the Sphinx at Giza could hold the key to a link with Mars. Is there something on Mars which would shock mankind? Robert Bauval and Graham Hancock, authors of the bestseller Keeper Of Genesis, think there could be. Already, in the first two parts of their fascinating series, they have examined the monumental structures in the Cydonia region of the Red Planet that could point to their existence of a long-dead civilization. And they have drawn parallels with the Sphinx and pyramids of ancient Egypt. Their speculation may not be so extraordinary, given that scientists believe a meteorite from Mars contains a fossilized organism that was alive billions of years ago. Today, in their final installment, the authors ask whether the space agency NASA is keeping the facts a secret from all of us. Conspiracy theories abound over NASA’s role in the Monuments of Mars affair – and with good reason. The space agency’s almost unbelievable lack of interest since photographic Frame 35A72 was taken by the Mars orbiting Viking craft in 1976, and its obstinate disregard for calls from other scientists to investigate the Cydonia mystery further, have raised suspicions of a cover-up. And why not? We know that our governments selectively censor potentially traumatic or destabilising information. If something has been found with the potential to upset established social values and religious beliefs, then it is reasonable to suppose we might not have been told about it yet. What makes this seem more probable is the facet that NASA’s probe, Mars Observer, scheduled to rephotograph Cydonia in 1993 in response to growing pressure, failed to do so due to alleged technical problems (the orbiter was ‘lost’ by mission control at the crucial moment). Also noteworthy is the fact that NASA’s constitution authorizes it to co-operate with agencies directly concerned with national defense and specifically obliges it to withhold from the public information classified to protect national security’. It is, therefore, by no means impossible that information has been withheld. At any rate, it does seem odd that NASA, which steadfastly scorned any suggestion that the Martian pyramids and Face might be signs of civilization has in the past two weeks embraced the implications of a few fossilized microbes in a Martian meteorite. But if NASA really does have a secret interest in the Monuments of Mars, it would be expected that such an interest would also have been manifested here on Earth – in, particularly, the three great pyramids and the Sphinx at Giza in Egypt. In March 1995, a German scientific team discovered a mysterious ‘door’, with handles made of an unknown metal, lies at the end of a narrow (8 in. x 8 in.) 200 ft. shaft which cuts through the body of the pyramid from the south wall of the so-called Queen’s Chamber. It was several weeks before new of the discovery was leaked to the Press. Active very like NASA, the Egyptian Antiquities Organization (EAO) first made curious accusations of a hoax and malpractice, then belatedly admitted the find by downplayed the importance and finally opted for silence. A proposal to put a fiber – optic camera under the door was mysteriously shelved on the pretext that nothing of importance would be found. Quite unexpectedly, however, this was reversed in March this year when Egyptian scientist Farouk El Baz, a former NASA consultant, was chosen by the EAO to lead a team scheduled to start work next month, will deploy equipment designed by Spar Aerospace which builds the hydraulic arms used by NASA Space Shuttles. FACT: A remote-sensing specialist in the U.S. , Dr. James Hurtak, was the first scientist to show interest in the NASA photographs taken by Mariner 9 in 1971 of possible pyramids in the Elysium region of Mars. In 1975, a year before the Viking pictures of Cydonia, he predicted that further finds of similar structures, including a Sphinx-like monument, would be made on Mars and that they would all prove to be connected, in a great cosmic blueprint, to the Giza monuments in Egypt. Hurtak does not deny that he has close links with California’s prestigious Stanford Research Institute (SRI) which has participated in controversial experiments on behalf of the U.S. Defense Intelligence Agency using psychics to pinpoint secret military installations. We have confirmed that a s early as 1973, the EAO granted a license permitting the SRI to search for subterranean tunnels and chambers around the Great Sphinx. This work continued until the early Eighties. FACT: In 1991, a team led by Boston University geologist Dr. Robert Schoch resumed the quest at the Sphinx. Using remote-sensing equipment, U.S. scientists detected a large rectangular chamber concealed in the bedrock 20 ft. under the front paws of the monument. At the time, the EAO refused to allow the chamber to be investigated and withdrew the team’s license. FACT: In March this year, a few days after the announcement that Farouk El Baz would open the ‘door’ inside the Great Pyramid, the EAO granted a one-year renewable license for another project at the Sphinx. Last month, information was leaked to the U.S. media that nine further chambers and tunnels had been identified and that the sensors had picked up indications in all the them of the presence of metallic objects. However, senior EAO officials denied that anything had been discovered, claiming the story was a lie. Before the end of this year, NASA will launch two probes to Mars – an orbiter, Mars Surveyor 1, and the Pathfinder lander. Officially, neither will be going anywhere near Cydonia. The truth may indeed be ‘out there’ but how soon will we be told about it?